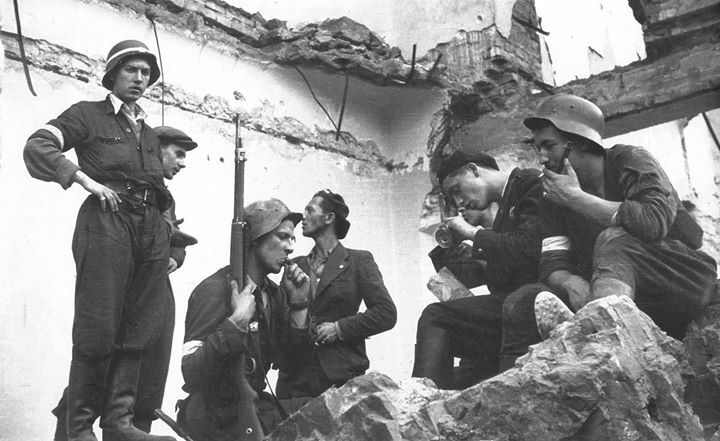 Polish resistance fighters, Warsaw 1944. Many years ago, right after the fall of communism in Eastern Europe, I was asked to write a book about the events. Rachel took the photos, I wrote the text. The book, which appeared only in Hebrew, was called “Lenin Does Not Live Here Anymore. When we visited Warsaw, we were astonished by the many places in the city with metal plates announcing “(Name) was executed by the Germans at this spot. Until then we had no idea that the Polish resistance had opposed the Nazis so fiercely. The Polish parliament decreed that anyone who uses the words “Polish extermination camps” is committing a crime punishable by three years in prison. The right description, according to the Poles, is “Nazi extermination camps in Poland. Were there Polish collaborators with the Nazis? Of course there were, like in every occupied country. Without making any comparison, there are lots and lots of Palestinian collaborators in today’s occupied territories. The Nazis did not really make a serious effort to gain Polish or Ukrainian cooperation. Hitler’s secret plan was to exterminate or enslave all the Slavs too, right after the Jews, in order to create more Lebensraum for the German nation. Honest disclosure: While my father’s forefathers had come to Germany from the west, my mother’s forebears had come from Krakow. My father, who had enjoyed a classical education, always insisted that our forefathers had come to the Rhineland with Julius Caesar (no evidence available), but my mother had to admit that her grandfather had come from Krakow, which before World War I was a part of Austria. I don’t believe that this exposition of facts will help. The sentiments are too deeply entrenched. But what the hell.